CMG Sprinklers and Drains – can help if you need to re-design your sprinkler system. If for example you are adding a swimming pool in your back yard, we can move the sprinkler headsand sprinkler pipes to fit the new dimensions of your yard. We can redesign or add-on to sprinkler systemswhere the home owners needs change. 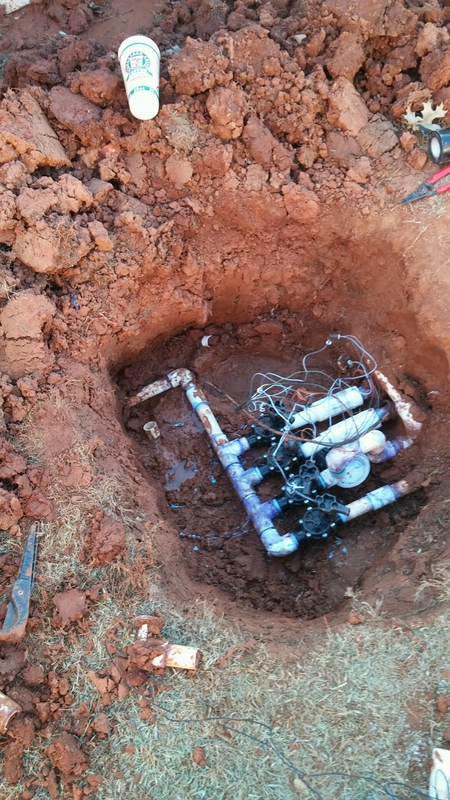 Sprinkler Repair is a central focus for CMG Sprinklers and Drains. Just like any car or home, a lawn sprinkler system must be updated and maintained. Typically people wait till spring to get the kinks worked out of their sprinkler system. I can tell you this, DON’T WAIT TILL MARCH TO GET YOUR SPRINKLER SYSTEM IN SHAPE. BY APRIL THERE WILL BE A FLOOD OF PEOPLE TRYING TO GET BROKEN SPRINKLER HEADS FIXED OR NEW SPRINKLER CONTROLLERS INSTALLED OR LEAKING BACK-FLOW VALVES REPLACED. THIS YEAR CMG SPRINKLER AND DRAIN WILL INCREASE OUR SPRINKLER REPAIR STAFF. LAST YEAR OUR WAITING LIST WAS 4-5 WEEKS BEFORE WE COULD GET TO THE CUSTOMER. WITH THAT BEING SAID, CMG WILL NOT COMPROMISE ON THE QUALITY OF OUR WORK TO GET TO THE NEXT CUSTOMER ON THE LIST. LAST YEAR WE LOST BUSINESS BECAUSE WE COULD NOT GET TO EVERYONE IN A TIMELY MANOR. HOWEVER, EVERY CUSTOMER WE DID WORK FOR WAS HAPPY AND SATISFIED WITH THE JOB WE DID. CONSIDER GETTING YOUR SPRINKLER REPAIR WORK DONE ANY TIME OTHER THAN THE SPRING. FOR THOSE OF YOU WHO HAVE NO CHOICE AND MUST HAVE WORK DONE IN THE SPRING, SCHEDULE AS EARLY AS YOU CAN. OUR SPRINKLER REPAIR WORK IS TOP QUALITY AND OUR PRICES ARE FAIR. IT IS OUR GOAL TO GET TO CUSTOMERS QUICKLY IN MARCH AND APRIL, WHILE MAINTAINING OUR QUALITY OF WORK. The dirt that was taken out to make the trench is hauled away. It is replaced by some type of small stone or gravel depending on what is desired or available. I prefer crushed 1 inch lime stone. It is the most economical option in my area. Pea Gravel or some other type of small stone can work just as well. The lime-stone or gravel is placed in the trench on top of the perforated Drain Pipe and filled all the way to the surface (ground level). 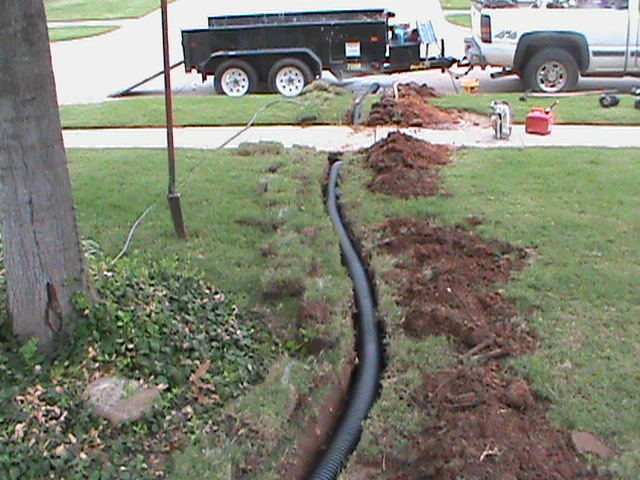 In some cases where the French Drain needs to be deep or is being placed in sandy soil, a special trench liner must be placed in the trench before the perforated Drain Pipe or the Gravel are installed. This helps maintain the integrity of the trench over time. 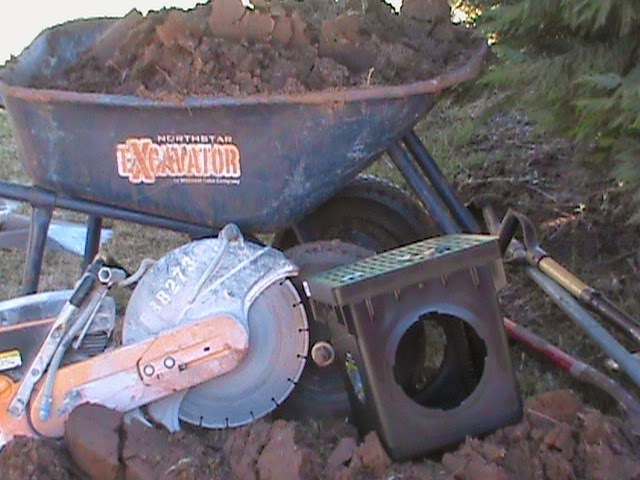 It also increases the cost of the French Drain and the amount of time to install it. I install a trench liner in a French Drainabout 20% of the time. Most of the time a liner in not needed.